FAQs about these great offers. + Which suits/garments are available for these offers? 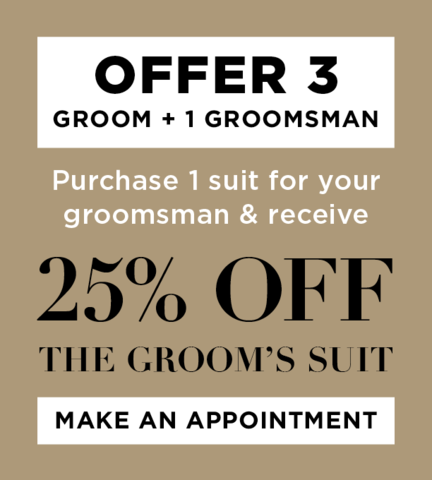 These groom's offers are available on all our collections including our latest offerings of Ready to Wear and Made to Measure suits. + What is the Offer to get the discounts off the Groom's Outfit? The discounted outfit will include only the garments purchased with all other outfits. If only suits are purchased, then only a discounted suit will be offered. If suits, shirts and ties are purchased, then the discounted outfit will include a suit, shirt and tie. + What is the offer to Dress the Groom for Free? We will happily supply one Wedding Outfit when three or more outfits are purchased and placed as one order. A Wedding outfit includes a suit, shirt, vest, tie and accessories as required. This offer is available on all brands in-store, including made-to-measure suiting. This offer is not available in conjunction with any other offer. If only three suits are purchased, we will happily supply a Free suit for the Groom. + What do I get for Free? The free outfit will include only the garments purchased with all other outfits. If only suits are purchased, then only a free suit will be offered. If suits, shirts and ties are purchased, then the free outfit will include a suit, shirt and tie. Our garment alterations are done by an approved company which meets the high standards of altering fine garments as set by Ron Bennett Australia. Alterations are not free, and are charged at the standard rate on all outfits if required, including for the free outfit. + What if there are two grooms in our wedding party? These offers apply to group booking so it doesnt matter if you require outfits for one groom or two grooms. With a party of 4, one outfit is free. With a party pf 3, one outfit is half price. With a party of 2, one outfit is 25% off. + Are there any exceptions to this offer? This offer may not apply to sale items during our major sale periods. Ron Bennett Australia reserves the right to change the terms and conditions of this offer at any time with notice on its website, or at any other time if and when required.